Motorists are sending vehicles slamming into buildings all around town. Recently, we profiled the rebuilding of a historic building on the corner of East Broadway and Shelby Street after it was hit by a speeding, wrong-way driver. With a little help from co-owners at Forza Architecture and 5253 Design Group, the building is looking as good as ever. “They built things so much more robust back then than they do now,” Stephen Tracy, principal at Forza, told Broken Sidewalk. “This building is very solid. There was never a question of whether we were going to take it down all the way.” That’s lucky for Louisville. More often, a building hit by a motorist is torn down or left severely disfigured. It turns out that motorists hitting stationary objects—houses, stores, power lines, bridges—is exceedingly common in Louisville and across the country. According to the Storefront Safety Council, an advocacy group that keeps tabs on such crashes, motorists drive their cars into commercial buildings 60 times a day across the country (that doesn’t count houses or other objects). Those crashes claim 500 lives annually and cause over 4,000 injuries. Not to mention losses to business and the economy due to repairs or potential demolition. Motorist vs. building research data from the Storefront Safety Council. These crashes—and the way the media covers them—helps illustrate just how much of a car-centric society we’ve become. Reading most headlines, you’d think we’ve already embraced autonomous vehicles and rogue cars are gunning for our homes. The passive voice conceals a human was involved at all. Sometimes a news story even makes the event into a sort of joke, showing just how jaded to street violence we’ve become. People’s lives are at stake here. Worse, they illustrate how dangerous we’ve allowed our streets to be designed. Modern traffic engineering focused solely on automobile efficiency and speed creates deadly places for people. We need to completely rethink our approach to street design to take into account safety for all users—especially on our major streets and arterials that provide the most connections throughout the city. Speed, lane width, sidewalks, street trees, meaningful density, and geometric design all play a part in creating a safer environment for everyone. Many incidents of drivers hitting buildings go unnoticed, without mention in the news. 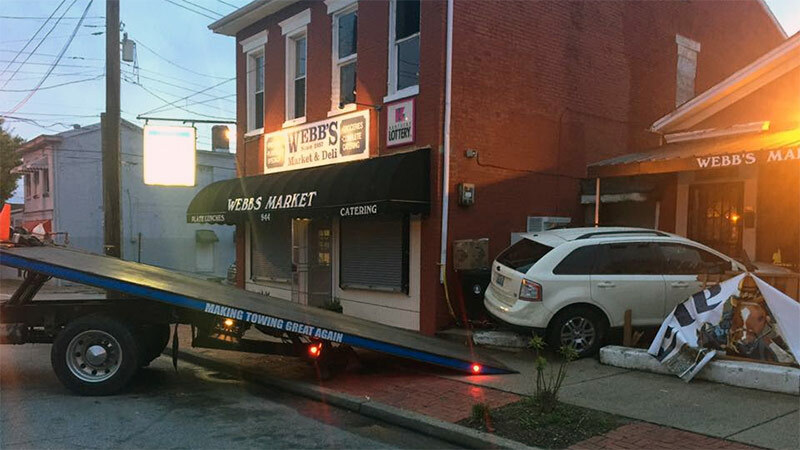 For instance, we were the only outlet to cover the the demise of a 160-year-old Phoenix Hill building after motorists collided on Jefferson Street in 2015. Plenty of others do make headlines, especially when a spectacular partial collapse is involved like on Broadway. We collect the headlines locally under our Carnage analysis section. And there are a lot of them. Take a look below for a 14-month roundup of only media published motorist vs. building crashes in the Louisville area. Another unfortunate trend involving motorists driving into buildings is the intentional act—using a car as a battering ram for a robbery. In less than 24 hours last July, motorists rammed two gun shops—one in Jeffersontown and another in Fern Valley—stealing guns and sparking a SWAT incident in one case (WLKY, WDRB, WDRB). In December, a motorist intentionally drove a vehicle through a shoe store at Cane Run Road near Crums Lane in Shively. Police said the suspect stole “lots of Air Jordans” (WDRB). And this past March, a Wisconsin woman was arrested after intentionally driving a vehicle into a store at New Cut Road near Palatka Road (WDRB). There’s a joke here about Billy Joel teaching Drivers Ed. I remember, years ago, there was an incident at the Wallace Center where someone drove their car into one of the facings there. It is still wild to me that this happens. I remember when I was a kid someone drove through the wall of Chism’s hardware store in St. Matthews. I think that was the end of Chism’s. First and Oak: pulled a semi out of this one three times. Moral ? Trucks shouldn’t be allowed in historic districts (why we built Ninth St), and one way streets makes it worse. Second and Oak: also second or third time. If I remember correctly, a car slammed into the Mag Bar a few years back.